The Thames is a tidal river making London vunerable to flooding. 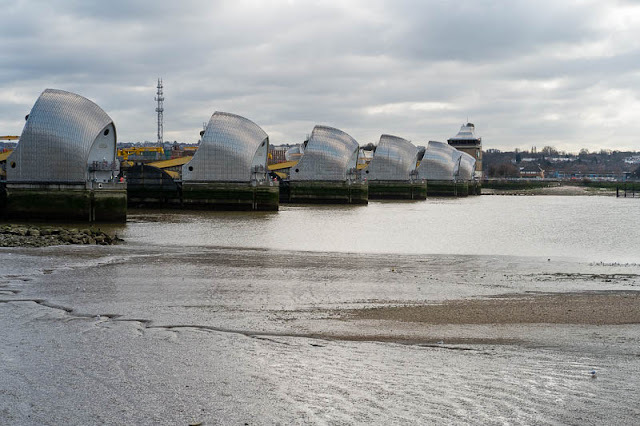 To protect the city from massive flooding the Thames barrier gates were built in 1982. As they are approaching the mid point of their design life and the requirement to close the gates has been increasing in recent years it raises the question should new or additional gates be built. The environment agency believes we will be ok until 2070. I guess we will see what global warming determines. Lets hope for the best then, 2070 is a long way away. Another 1953 flood will come and London will suffer gates or no gates. Interesting, let's hope the barrier gates can work well till 2070. Last year we took a boat trip from Westminster Bridge down to the Barrier. I've always wanted to see it close up, and it was a great trip. I've never been out this far to see this barrier. Hopefully, they will continue to serve their purpose for a while longer. Quite massive, by the look of them. Very interesting post - these gates are quite stylish. I wonder if such gates would be built today. In France we're getting to the stage where such projects have very little chance of getting off the ground because of environmental issues. 'Old Father Thames keeps rolling along' & we hope the 'great street paved with water' doesn't burst it's banks!! It is quite a dramatic scene. Just looking, I couldn't figure out how they work. Guess I will need a tour. very arty gates , hope they will be effective !